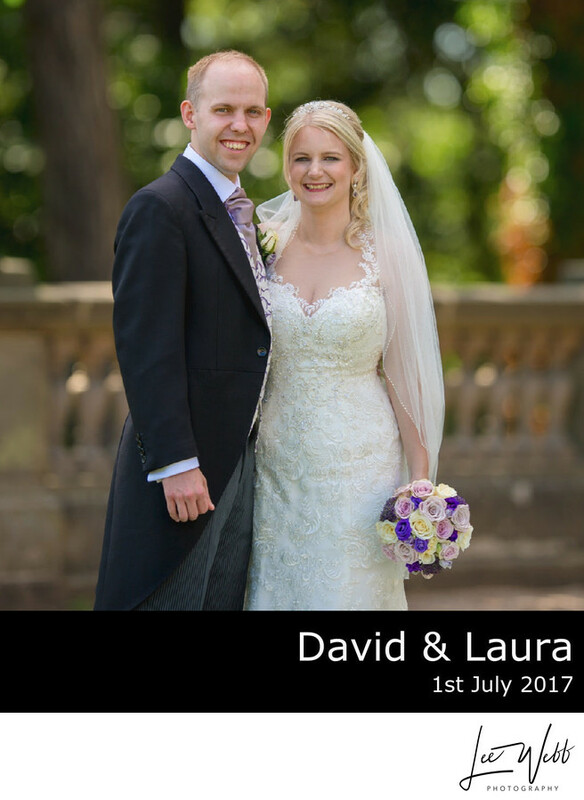 David and Laura got married at Fladbury church near Evesham, before moving on to their wedding reception which was hosted by the Wood Norton Hotel on Evesham road. I have been a Wood Norton recommended wedding photographer for 12 months, and I am one of only three recommended by the wedding venue. 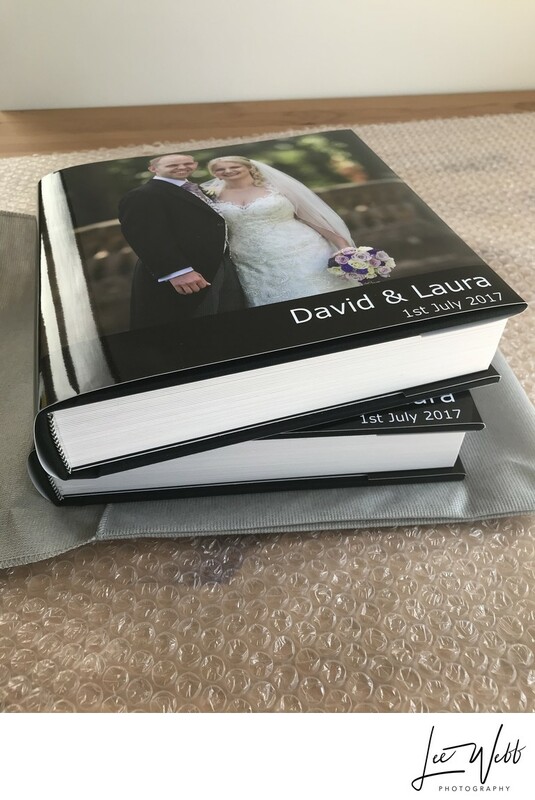 For their wedding album, David and Laura chose to have a 30cm square main album complete with an acrylic front cover, with a black leather spine and back cover. 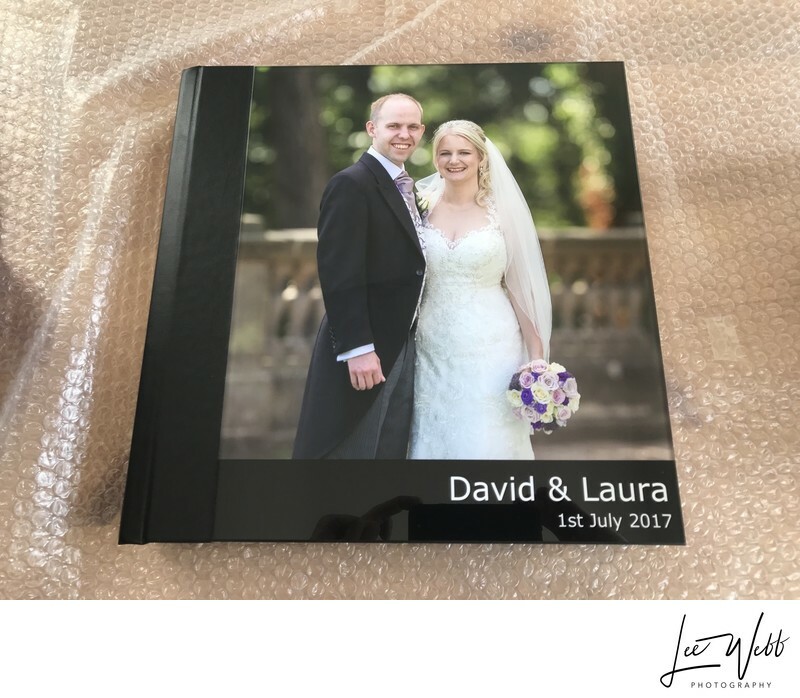 To top this off, they also ordered a matching presentation case, and two 20cm square parent albums. 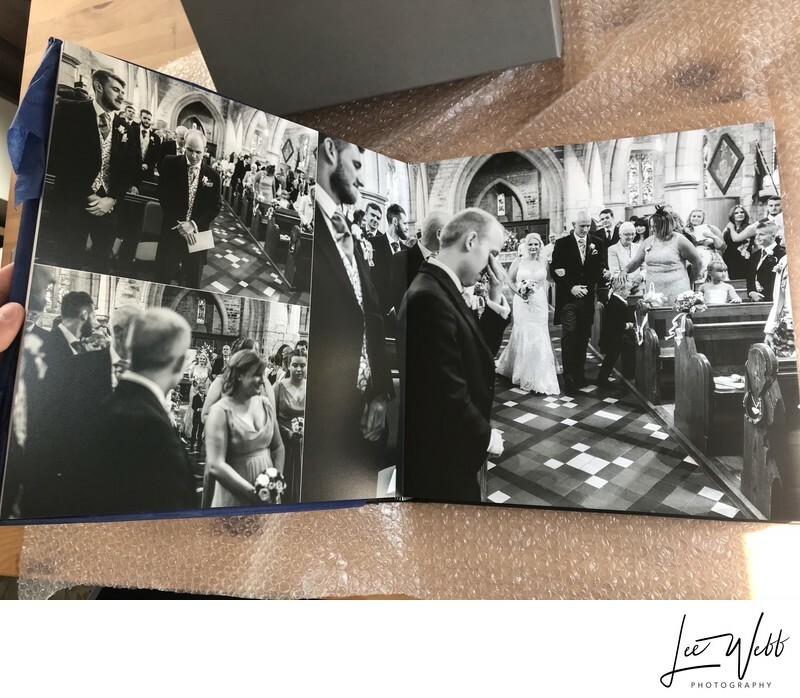 As of 2018, this has been the biggest wedding album I have produced, containing over 200 photos which are spread carefully over 74 pages. The acrylic panel on the front of the album is solid, 6mm thick and really brings life to the image that's set behind it. The acrylic panel is also extremely hardwearing - the one sample album I have with an acrylic cover has been shown 2 or 3 times a week to hundreds of different people, and looks as good now as the day when it was new. 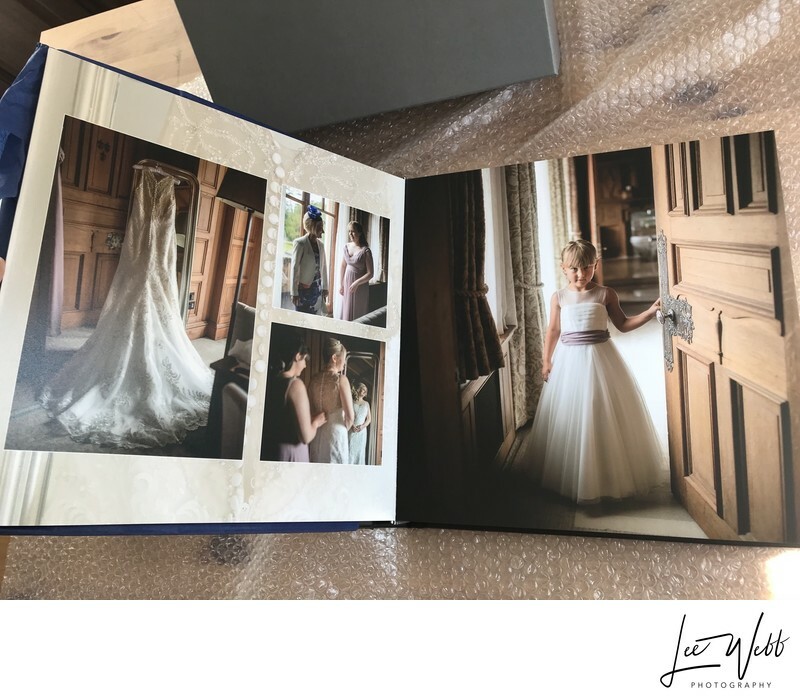 On the inside, the images are printed straight onto the solid pages, and full page printing is possible with no visible seem between the left and right pages. The images are super-sharp and look stunning on the high resolution pages. As you can see in the above photo, the right-hand image stretches over the centre of the double page spread flawlessly. The parent albums use exactly the same artwork as the main album, and features the same luxuriously thick pages too. These albums show the cover-wrap finish; other finishes are available to both the main album, and the parent albums. 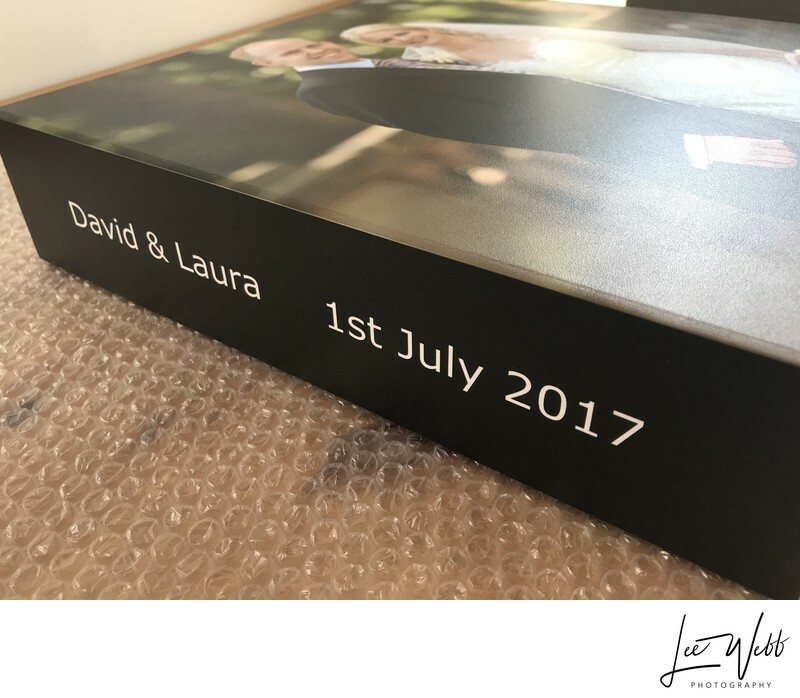 The presentation cases are hand made from wood, have a printed finish and a soft velvet lining in order to keep your wedding album safe. On the inside of the presentation case is a lift-tab in order to allow you to remove your album safely and efficiently.